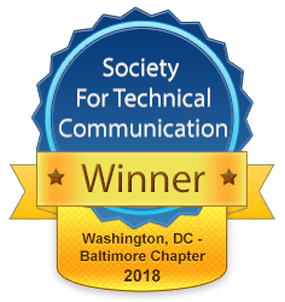 For the eighth year in a row, Nexight’s technical communications products have won awards from the Washington, DC-Baltimore Chapter of the Society for Technical Communication (STC) annual competition. 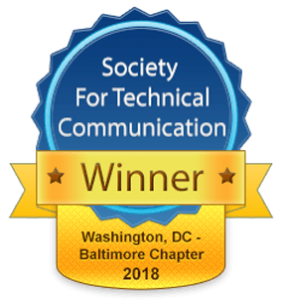 From Innovation to Practice: Re-Designing Energy Delivery Systems to Survive Cyber Attacks, Award of Excellence – This report highlights 35 Cybersecurity for Energy Delivery Systems (CEDS) products that have been successfully transitioned to the energy sector and are now available for energy companies, vendors, and researchers to use. Also featured are another 12 products that are soon emerging from CEDS research and development after successful demonstrations with industry partners. It is a key tool for outreach to the energy industry, as well as DOE leadership, Congress, and taxpayers. The Regenerative Medicine Standards Landscape, Award of Excellence – Published in February 2018, this report provides a preliminary snapshot of the current landscape for regenerative medicine standards and details nearly 200 existing standards relevant to the cell therapy, gene therapy, and tissue engineering sectors of regenerative medicine, providing an easy reference for those who may not be aware of the standards available or under development. REMADE Institute Technology Roadmap 2018, Award of Merit – The REMADE Institute Technology Roadmap outlines specific activities focused on increasing the recovery, reuse, remanufacturing, and recycling (collectively referred to as Re-X) of metals, fibers, polymers, and electronic waste (e-waste) in support of REMADE’s mission. The roadmap is currently being used to inform REMADE Institute projects through a public call for research and development proposals and seeks to encourage the commitment of additional industry investments. For the full list of products, visit the STC website.